So just how do you begin your very first greenhouse plant? Well, the first thing that you have to realize is that you are on the verge of a very momentous occasion in your greenhouse gardening hobby. Beginning your very first greenhouse plant is a surefire sign of success at what you love to do, which is gardening in your greenhouse. However, since you are new to this hobby, you may be perplexed, at least at first, about how to exactly go about beginning your first greenhouse plant. If this situation and condition describes you to a tee, then read on about how to begin your first greenhouse plant. 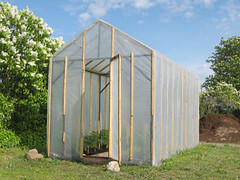 A greenhouse permits you to grown all your own plants from just seeds, and it is a relaxing hobby that a lot of people enjoy. On the more practical side, it is a hobby that allows you to save quite a good bit of money; this is especially true when you consider the costs of just purchasing plants outright. It is possible to grow a wide assortment of plants in your greenhouse, yet a lot of people actually depend on their greenhouses as a way to get a head start on growing their vegetables for their summer gardens. The first step is making up your mind with regard to what you want to grow! You must buy both your seeds and any other planting supplies that you will require. 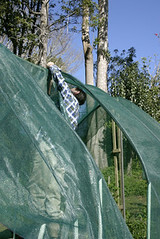 Prior to that, though, you have to ensure that your greenhouse is already set up and ready to utilize. Inside the actual greenhouse, you have to lay out your containers for planting and make certain that you fill them right below the brim with the soil mix that is meant to start seeds. You should also see to it that the soil spreads evenly, which you can accomplish by breaking up any big clumps of soil (if they exist). Next, you should see to it that you end up poking tiny holes within the soil in the middle of each and every container that you have in your greenhouse. You should then meticulously put the seeds for your plants into these holes. Then, be certain to poke said holes with your fingers or another small item, such as a pencil. It is imperative that you closely obey the instructions on each and every seed packet with regard to just how many seeds you ought to be planting into every container. Now cover the seeds by using the soil! 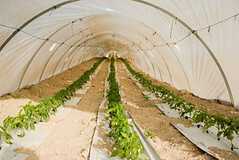 At this point, you have to depend on water, which is the basis to having a successful greenhouse. Take some water in a spray bottle, and then spray these newly planted seeds with some water. This next piece of advice is not mandatory and is entirely up to you whether you want to follow it or not. Either fertilizer or plant food may now be included in your pots. As always, take extra care to make certain that you are closely obeying the directions for the specific kind of fertilizer that you are utilizing (assuming, of course, that you are indeed using fertilizer at this stage). Your attention should now switch to basic order within your greenhouse. To wit, be sure to write out and then attach some labels for each and every container that you feature in your greenhouse. This will aid you in remembering precisely just what you have been planting. The last thing that you have to do now is just to worry about presentation and other aesthetics-related concerns. For instance, you should now put the containers right into the plant flats and arrange them however you want inside your greenhouse. All that you really have left to do at this stage is just to simply sit back and watch your plants begin to grow in the coming months and seasons. After all of the work you put into your greenhouse, watching the rewards occur is definitely something that you should enjoy! As you just read, starting your very first greenhouse plant is not that difficult a process. You simply have to know precisely what you are doing. Always following the instructions on your bags of fertilizer is also something that you have to really adhere to if you want to have some spectacular plants at the end of this process. In the end, getting the nice-looking plants that you want all year round is well worth the effort of planting seeds in your first starter greenhouse . Just ask the millions of people who are already greenhouse hobbyists. 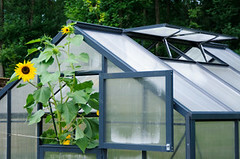 Which Greenhouse Building Do You Need For Your Greenhouse Project? Manganese Beneficiation Plant, Bauxite Beneficiation Equipment, Graphite ..
Hoodia Gordonii African Cactus Plant - What Did The Sans Bushmen Get For The ..